← And there went my well-planned day. 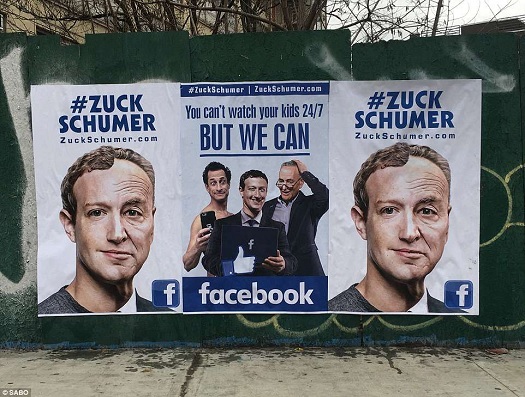 “So what’s zuckschumer.com?” I wondered? #ZuckSchumer represents the combined power of big tech monopolies like Facebook and Google that spy on our every move online. They sell our most private data to political targeting and advertising companies and to creepy Washington political operatives who protect them. #ZuckSchumer represents the power of peeping Tom billionaire CEO’s like Mark Zuckerberg and their political attack dogs and protectors like Senator Chuck Schumer. Don’t know how true any of it is, but since I’m already hardwired to hate them both I enjoyed reading it. With all that’s been in the news lately, Bookface might be in trouble. Some people might want to back up those family photos before they disappear from the Innertubes. One Response to Ouch. That’s activism. Not mention their common hatred of RKBA.